I am grateful to Petey for many reasons. He appreciates my humor. On an unrelated note, he’s pretty smart. He’s always on my side, no matter what crazy scheme I’m percolating. And when it comes to spouses, his standards are kinda low. But specifically, I’m grateful that my ever-loving husband loves eggs. I know that doesn’t seem like a big deal, but it really, really is. Pound for pound, eggs are just about the most nutritious protein out there. And eggs are cheap. A dozen can be routinely purchased for $1. That dozen can feed four adults. With eggs, the protein comes in at $0.25 per. That kind of fiduciary skill is flirting with magic. 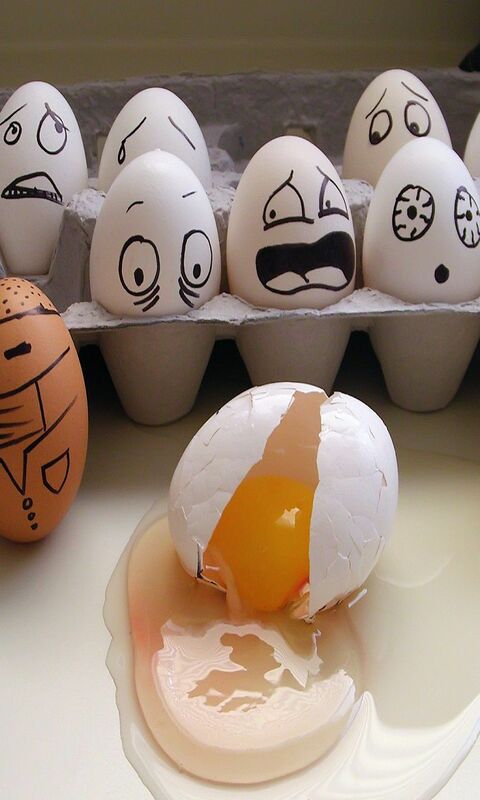 In eggs, as in much of life, simpler is better. And the simplest, tastiest, most satisfying way to cook and eat an egg is scrambled. When I was really little, like kindergarten little, I was having breakfast with some other kids that were a little older than me. I don’t remember who the kids were, it’s all a little fuzzy. But one thing I do remember all too well. My dining companions told me they ate their eggs sprinkled with sugar. They told me that once I tried it, I’d never eat them any other way. To this day I don’t know if that’s how they really ate their eggs, or it was all an elaborate, egg-wasting hoax, but those sweetened eggs were terrible, horrible, no good, very bad food. 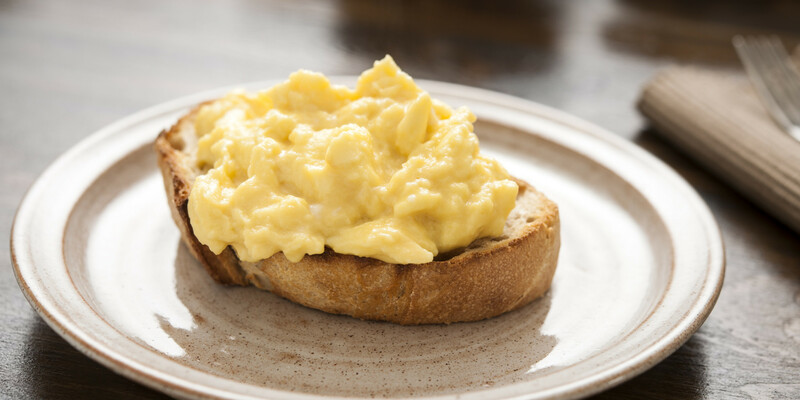 Decades later, I perfected extremely tasty and insanely easy scrambled eggs. It turns conventional egg scrambling on its head and takes less than ten minutes from carton to plate. I normally cook three eggs per person, plus one extra “for the pan”. Butter is mandatory and so is both salt and pepper, but no salt until the eggs hit the pan. The eggs cook very quickly, so if additions like herbs or cheese are desired, put them right on top of the eggs at the very beginning. As for tools, you’ll need a non-stick skillet, a silicone spatula, and a blender; either the immersion type or standard style. They’re very good plated over sautéed spinach, or with some lightly dressed baby greens on top. Break eggs into a high-sided bowl if using immersion blender, or into blender bowl. Blend on high until the eggs have lightened in color and thickened up a bit (about 1 minute). Put skillet on burner on medium-high (7 on 10 point scale). Add the butter and let it melt. When it foams, pour in eggs. Season, then turn down burner to about 5.5. Gently stir the eggs, scraping the center of the pan frequently to get the cooked eggs up, and the uncooked onto the pan bottom. Continue slowly turning down the burner as they cook, (it should be about 4 when the eggs are done), and stirring the eggs until they’re soft and very moist (their residual heat will finish cooking the eggs on the plate). Serves 2. Eggs are so darn delicious. I know there are folks out in the world who would rather be eaten by crocodiles than eat an egg; heck my own child is one of them. But they’re wrong. And The Kid actually loves one of the best egg dishes in the history of egg dishes—a cheese omelet from Waffle House. So even the most egg-phobic can find something to love in an ovum. Thanks for your time.